London, known for fostering copious musical acts, has once again served as breeding ground for an up-and-coming musical force. Narrow Plains, comprised of guitarist and vocalist Charlie Ferriday, bassist and vocalist Roger Connick, and drummer and vocalist Stuart Connick, released two new songs this past August. Along with their EP Somewhere in Between, Narrow Plains have hit the ground running. With seven released songs, big dreams, and undoubted talent, the band is making folk-rock waves. How did Narrow Plains come to be? Charlie was playing solo as a singer/songwriter while he was at University and had written some songs for acoustic guitar only. He and Stu (my brother) had started playing some gigs together and so they had rearranged the songs to include percussion. They really wanted to record them but decided they needed a more complete overall sound, so they invited me to join them to play bass for the recording session. We went down to my Gran’s place in Dorset with our instruments and some recording software. We spent a week playing the songs, rearranging them for a band format and then recording them. By the end of it, we had recorded five songs that we really liked and we decided to release them as an EP, “Somewhere In Between”. We were all really enthused by the EP and decided to start playing it live. We did a lot of open mic’ sessions and accepted any and every gig that we could so that we could get tighter as a band. We all enjoyed the experience so much that we have stuck together ever since. What was the process like writing music together while in entirely different locations? How were you able to manage that? As I mentioned, the original songs came about in a slightly piecemeal fashion but nowadays we write the new songs together. All the songs have a different origin but, often, Charlie will come up with a riff or a chorus and bring it into the practice room. We then all chip in with ideas or lyrics until we have a basic arrangement for a song. We have got to know each other even better over the last couple of years, which is important because we are our own worst critics. It sometimes gets a bit heated but, somehow, we manage to get the songs written and still talk to each other afterwards! The band did a really neat cover of “Cannonball” by Damien Rice. Who would you say your musical influences are? Thanks, he’s a great artist and we all love that song! The new acoustic/folk movement has really shaped who we are, and bands like Mumford & Sons, Ben Howard, Noah and the Whale and Bon Iver continue to inspire us all. Charlie’s guitar playing has definitely been influenced by Newton Faulkner, particularly the slap technique you can hear prominently on our song “Dreams”. As we were growing up it was modern American rock music that sparked all our passions for music. We were (and still are) into bands like Jimmy Eat World, Blink-182 and Foo Fighters. 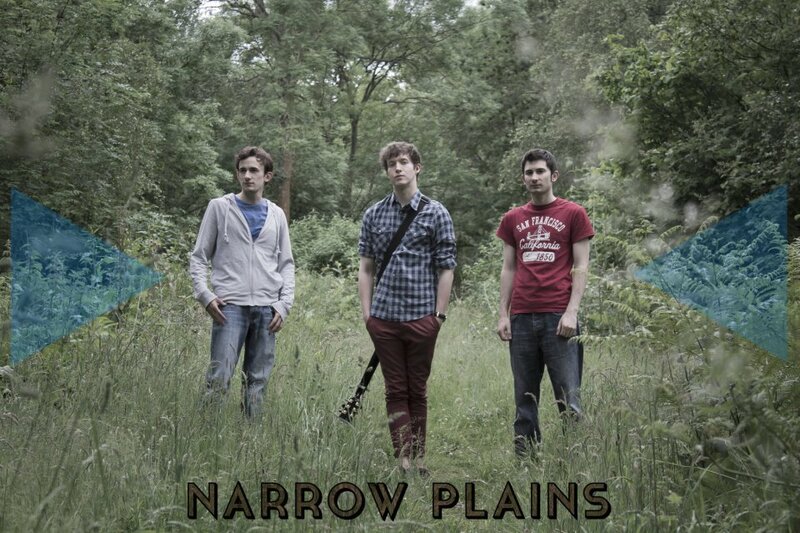 This past summer Narrow Plains played multiple well-known festivals. How was this experience? Brilliant! We really enjoyed playing at so many festivals. It was an amazing experience to play in front of a lot of different audiences and on different stages. It has filled us full of enthusiasm to record our debut album and (hopefully) tour it next year. “So Rewind” has been a favourite at our gigs for some time. We are very pleased with the final result. Although it is slightly different to our earlier material, it is a natural development and shows a bit of versatility with its pop overtones, samba-like rhythm and vocal harmonies. “Keep You Anyway” is another crowd pleaser. We think it shows a more indie sound and is a bit more raw than most of our songs. Charlie plays the harmonica on it and Stu and I get the chance to lay down a slightly heavier rhythm. They are both songs that we have been playing live for the last year or so. We decided to release them as a “double A-side” single because we wanted to give our followers and friends a taster of how our sound is progressing and an indication of the type of songs that we’ll be recording on our debut album. We recorded the basis for both songs again outside of the studio. However, we did have some great help from Chris Daniels in the final mixing and mastering at his studio in Brighton. Where did the idea for the Narrow Plain’s logo come from? After we had recorded the EP, we all got together for a weekend at Charlie’s parents’ house in the south-west, bouncing ideas around and setting up the artwork with our great friend, Kraggy, who is a brilliant graphic designer. He was setting up our website and all the artwork for the EP. However, we were struggling to find a logo. Charlie’s Dad mentioned that he had heard there had been a really weird crop circle that had appeared overnight at a place, called Cley Hill, near his house. Cley Hill is famous for UFO spotters as there have been a lot of sightings, although some people put that down to the strong cider that is produced locally! We immediately googled it and found that a perfect geometrical shape had indeed been cut into the surrounding countryside. We all really liked the crop circle and so Kraggy used it as the inspiration for our logo. This entry was posted in Uncategorized and tagged Interview, Music, Narrow Plains, Q&A. Bookmark the permalink.